Washington, February 15: Pacific Island nation of Kiribati has established the world’s largest marine protected area as part of an effort to protect coral reefs and rich fish populations threatened by over-fishing and climate change. The 410,500-square-kilometer Phoenix Islands Protected Area (PIPA) conserves one of the Earth’s last intact oceanic coral archipelago ecosystems, which includes eight coral atolls and two submerged reef systems in a nearly uninhabited region of abundant marine and bird life. It also includes underwater mountains and other deep-sea habitat. The creation of PIPA was first announced by Kiribati in 2006, during a Conference of the Parties to the Convention on Biological Diversity in Brazil. Now, the adoption of formal regulations for PIPA by Kiribati on January 30 has led to the doubling of its original size, making it the largest marine protected area on Earth. Kiribati and the New England Aquarium (NEAq) developed PIPA over several years of joint scientific research, with funding and technical assistance from Conservation International’s (CI) Global Conservation Fund and Pacific Islands Program. “Kiribati has taken an inspirational step in increasing the size of PIPA well beyond the original eight atolls and globally important seabird, fish and coral reef communities. The new boundary includes extensive seamount and deep sea habitat, tuna spawning grounds, and as yet unsurveyed submerged reef systems,” said Greg Stone, the NEAq vice-president of global marine programs. Located near the equator in the Central Pacific between Hawaii and Fiji, the Phoenix Islands are part of the Republic of Kiribati, which comprises three distinct island groups—Gilbert Islands, Phoenix Islands and Line Islands—with a total of 33 islands to make it the largest atoll nation in the world. “The creation of this amazing marine protected area by a small island nation in the Pacific represents a commitment of historic proportions; and all of this by a country that is under serious threat from sea-level rise attributed to global warming.,” said CI President Russell A. Mittermeier. “The Republic of Kiribati has now set a standard for other countries in the Pacific and elsewhere in the world. We are proud to be associated with this effort that helps the people of Kiribati, and we call on governments and private conservation groups everywhere to support Kiribati in its efforts and make similar commitments to protect their own natural systems,” Mittermeier added. So far, research expeditions have discovered over 120 species of coral and 520 species of fish, some new to science, at the Phoenix Islands. Some of the most important seabird nesting populations in the Pacific, as well as healthy fish populations and the presence of sea turtles and other species, demonstrated the pristine nature of the area and its importance as a migration route. 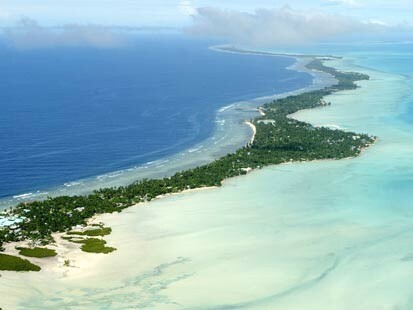 The restriction of commercial fishing in the area would result in a loss of revenue that the Kiribati government would normally receive from issuing foreign commercial fishing licenses. NEAq and CI are helping design an endowment system for Kiribati that which will compensate the government for the foregone commercial fishing license revenues. The plan, which will also cover the core recurring management costs of PIPA, allows for subsistence fishing by resident communities and other sustainable economic development in designated zones of the protected area.